President Barack Obama has wasted little time this week, putting his stamp on the government, issuing a slew of executive orders, and previewing many of the new directions his administration will take, many completely altering the courses the previous administration took in terms of everything really... from foreign policy, to government accountability... and of course our embattled economy. Clearly his strategic vision is very much in line with that of the tutoring and mentoring community. I’m no economist, but common sense might suggest that, if more people had better access to the marketplace’s goods and services, and more people were making and spending money into the marketplace, this broader exchange of income might invigorate the economy as a whole. Isn’t this what those stimulus checks were all about a few years back? Maybe by giving people the tools and skills to put money in their pockets on their own, stimulus wouldn’t have to wait for a check. And remember – this won’t be a mission “out of charity”– we can offer more opportunity to willing citizens… providing access to skills that will allow more people to help themselves! The "teach a man to fish" philosophy. The state of the economy calls for action, bold and swift, and we will act — not only to create new jobs, but to lay a new foundation for growth … We will restore science to its rightful place, and wield technology's wonders … we will transform our schools and colleges and universities to meet the demands of a new age. All this we can do. All this we will do. 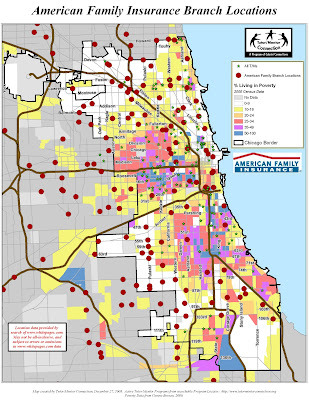 This map shows 2008 "failing school" data, collected from the Illinois Interactive Report Card. Schools in gray and red on this map are on the 2008 state/federal “watch” and “warning” lists… these schools are under the gun to reform their curriculum and show immediate improvement on their test scores. Failure to do so may lead to sanctions, penalties, restructuring, closure. These are the “failing schools” we hear about in the media all the time. The map shows a comparison of the data collected for this past year... compared to data from 2007. The comparison helps us see which schools are new to the list (red), verus those that remain on the list (gray), and those which were on the list but worked hard and got away (green). 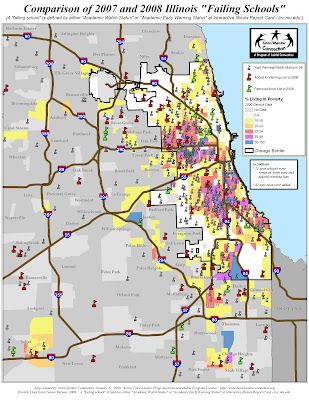 I zoomed in on the Chicago area, and if you count the number of schools that escaped the list (green), versus the number of schools that have been added this year (red), you will see that more schools have been added to the list than removed. A bad trend. What does this mean? Students across the area (not just Chicago, mind you) need additional help. Schools do what they can but their resources are often taxed. Classrooms are crowded, teachers are overworked, and negative peer pressure interferes with student decision making. There is relief for the students, the schools, and ultimately our economy. Students can find one on one help for their homework… one on one mentoring to help forge a personalized college/career plan… all with the support of positive role models and like-minded peers at a tutor/mentor program like Cabrini Connections. And there are hundreds of other existing programs like Cabrini Connections. Search the online Program Locator to find one near you. 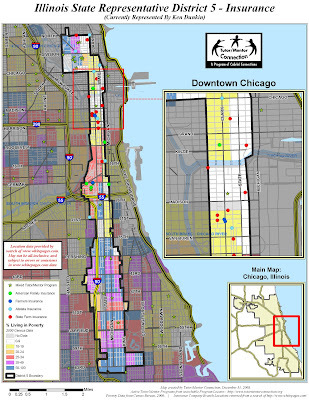 I'll point out that, a common misconception - possibly due to what we assume based on negative news stories - is that this is a City of Chicago problem. 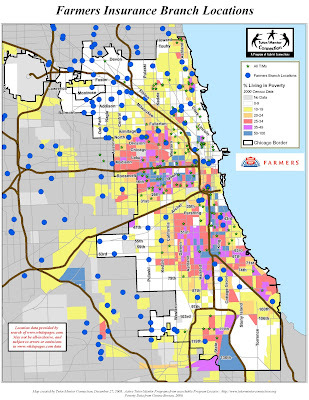 As the map above shows, there are “failing schools” in the wealthier suburbs too. Tutor/Mentor Connection founder Dan Bassill is currently working to get a South Suburban group started that takes ownership in getting programs going in that region. Please contact him if you are interested in this project. We honor [our soldiers] not only because they are guardians of our liberty, but because they embody the spirit of service; a willingness to find meaning in something greater than themselves. And yet, at this moment — a moment that will define a generation — it is precisely this spirit that must inhabit us all. For as much as government can do and must do, it is ultimately the faith and determination of the American people upon which this nation relies. It is the kindness to take in a stranger when the levees break, the selflessness of workers … a parent's willingness to nurture a child, that finally decides our fate. Please remember, as you become consumed with this spirit of service, that you can volunteer to work with students at tutor/mentor program locations. Through tutoring and mentoring you can help your community, your economy, your country. I would like to once again take a look at an elected political leader’s district to demonstrate how leadership there can use the Tutor/Mentor Connection's maps - as tools - when working with other community leaders (from businesses, places of worship, schools, hospitals, and universities) to build strategies that create and fund needed tutor/mentor programs... and in turn, improve the prospects for our children, our economy, and our democracy. 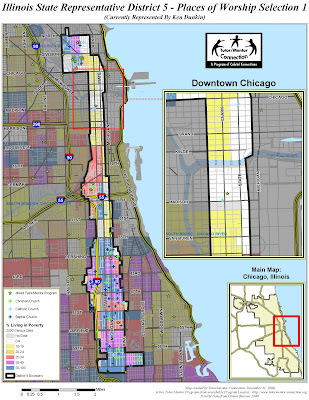 In this first map, we see that Illinois State Representative District 5 (currently represented by Ken Dunkin) is a narrow strip that stretches from the Near North Cabrini-Green area, South to past 63rd Street. The far North and most of the Southern part of the district have neighborhoods of high poverty. Predictably, the pockets of high-poverty are littered with "failing schools," and consistent with other maps we’ve made, there are far too few tutor/mentor programs helping kids whose scholastic performance indicate a need additional help. How can our maps help coordinate efforts to fix this? Well, similar to the situation we looked at with Mt. 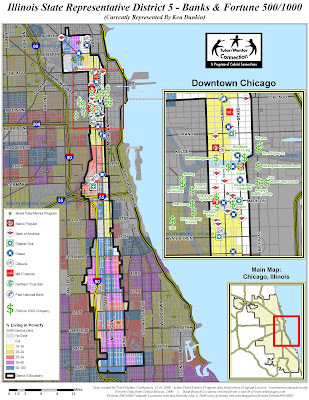 Sinai Hospital in Lawndale, hospital leaders at Provident Hospital of Cook County can perhaps work with Representative Dunkin to create strategies that support new and existing programs in their community. We discussed these potential strategies in past blogs that examined the roles of both Universities and Hospitals. Places of Worship also can play large roles in developing support for tutoring and mentoring. Their locations provide ideal hosting sites for new programs, as well as places where sermons can tie scripture to service, while pointing members to existing tutor/mentor programs. This next map shows several more Places of Worship in District 5. As faith leaders committed to social justice, what could they be doing to connect the rich people in this district with the poor people? The business community is vital to efforts that develop new and existing programs. As Dan Bassill reminds us in a recent blog, getting the attention of these business leaders and drawing their consistent support for non profits is not always easy. Multiple non profits doing the same work, but in different places, are in competition for the attention of the same donors. As we see, one part of District 5 cuts through the West Loop, with many businesses, including many banks. What could the State Representative of this district be doing to connect these businesses with the non profit tutor/mentor programs in the district? Without funding, programs die and kids are turned back to the streets for guidance. With funding, programs can continue to help students find the tutoring and mentoring support that lead to jobs… and increased income… perhaps home and car ownership?… Perhaps allowing businesses such as insurance companies to capitalize on places in the city that would represent new and developing markets for their goods and services. Or maybe businesses can simply encourage employees to volunteer their special talents and know-how to assist non profits, or use their web presence and in-store kiosks to post program information – creating awareness for customers, clients, and parents. 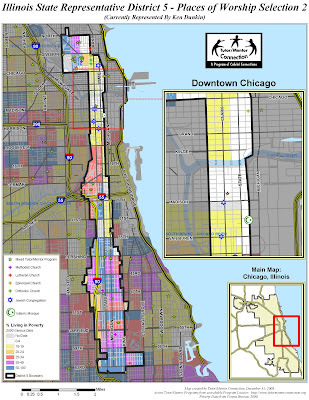 So why does Tutor/Mentor Connection (T/MC) create maps of political districts again? First, the maps are NOT intended to show where service work is, or is not occurring. They are also not meant to endorse, or criticize elected leaders (The voters should make those decisions). ... and where community assets, such as businesses, churches, colleges, etc. can collaborate to draw attention to poverty, and create long-term strategies that support students through tutoring and mentoring and ultimately help everyone in the community. The insurance industry is in a position to take a leadership role in the fight against poverty. In addition to financial resources, a company like Allstate (and its numerous branch locations scattered throughout the region) employs potential volunteers, who work to to protect us in our times of sickness, loss, and accident. In this series of maps, I explore the ways insurance companies like Allstate can work with Tutor/Mentor Connection... following examples set by other successful industry partnerships... and using documents from the Tutor/Mentor Institute's library... to take these needed leadership roles in improving the support for existing and new tutor/mentor programs... and in turn helping themselves. * The blog for American Family Insurance answers, in more detail, the obvious question: "Why should professionals from the insurance industry get more involved in tutoring and mentoring?" * The blog for Farmers Insurance explores potential leadership roles that can be filled by Insurance professionals. To learn more about the benefits of volunteer involvement for businesses, and how tutoring and mentoring can assist workforce development, please take a look at the following Tutor/Mentor Institute document. And for more information on why tutoring and mentoring makes sense in general, please read this document. Location data provided by search of http://www.whitepages.com/. 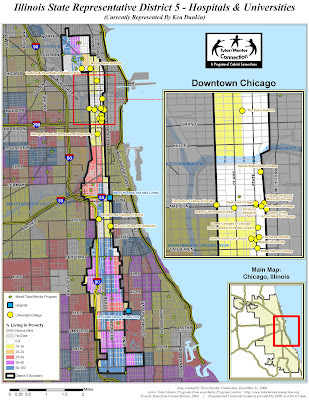 Map may not be all-inclusive, and is subject to errors or omissions in http://www.whitepages.com/ data. Perhaps you're asking: Why whould professionals from the insurance industry want to get more involved in tutoring and mentoring? What's in it for them? Well, maybe ideas can be taken from the legal community, who have banded together to find solutions to the need for more non-school tutoring and mentoring programs. In a presentation given by Lawyers Lend-A-Hand, it is suggested by attorney Carolyn Amadon that, "we have a profession that includes duty to invest in the community but also the know-how that is needed to really guide a child." It's my assumption that many in the insurance industry share this sense of duty and know-how. Expand markets and create new opportunities. Access to broader, more diverse labor pool. Enhance employee skills and development. Develop trust at the local level. Better manage physical and financial assets. The Tutor/Mentor Connection works to fascilitate the efforts of industries that share its values and goals... and recognize the social and business benefits of working together - in a tutor/mentoring capacity - to help our 7th graders obtain careers by age 25. * Begin a Communications Program: use internal and external communications to tell employees and customers about need for tutor/mentor programs in the same way advertising tells them of products and services a company offers. * Add Tutor/Mentor Programs to workplace fund raising: to enable employees to designate Cabrini Connections and similar tutor/mentor programs for payroll deduction contributions. 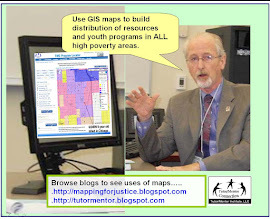 To find a program near you, please use the Tutor/Mentor Connection's online searchable "Program Locator." 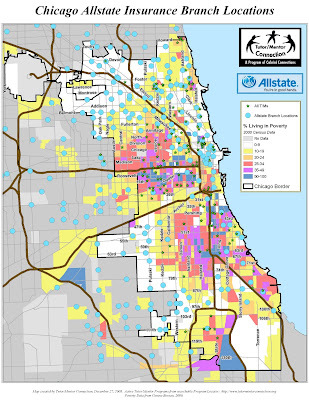 With so many State Farm Insurance branches scattered throughout Chicagoland, perhaps branches can work together to build strategies that fight poverty that improve the chances that kids near (and in) their markets grow up to become home owners, car buyers, and in turn, State Farm clients. Partnerships and alliances that improve support for tutoring and mentoring have worked for the legal industry, and with the close proximity of branches - and shared market/community interests - perhaps similar partnerships can benefit the insurance industry as well.